Nearly all scientific posters are organized into sections, with each section being one to many paragraphs and possibly including photos, charts, or other data. A great place to start your poster is by deciding what sections you are going to include. The easiest way to get started is to use a template. 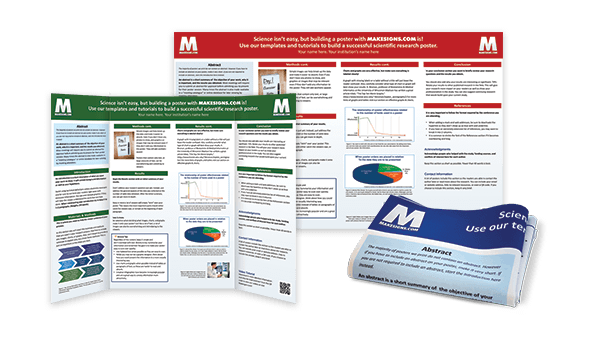 Your school or organization may have templates with their logo and branding, but MakeSigns.com also provides free scientific poster templates. Every section you include should have a purpose and be familiar to the viewer. The easiest way to decide which sections to include on your poster are to organize your information into 3 categories - Introduction, Research, and Conclusion. The Introduction sections set the stage and outline why you did the research you did. The Research shows all the data you collected and how you collected it. Finally, the Conclusion sections analyze and summarize your results. This is what the viewer ultimately takes away from your poster, so pay special attention to these sections. 1 What is my presentation about? 2 Why am I doing it and what do I hope to add to the conversation? 3 What were the methods I used? 4 What conclusions did I come to? 5 What are my recommendations based on this research? Most posters are divided into columns, with 1-3 sections per column. Each column is read from top to bottom and columns are read from left to right. Reading your poster in this order should give the viewer a clear picture of your research. If you have any further questions or comments about our tutorials, we would love to help you out. MakeSigns.com is easiest way to print your poster.